SAIL BLACK ROCK, the burgeoning sailing center comprised of Fairfield University and Sacred Heart University at Captain’s Cove Seaport in Black Rock, CT is adding more boats, sailors and events. On September 20 & 21, SAIL BLACK ROCK and Captain’s Cove Seaport will host the Sacred Heart University Invitational, the first intercollegiate sailing regatta in Fairfield County since college sailboat racing was conceived at Pequot Yacht Club in Southport in 1928. A dozen four-person dinghy teams from schools in Massachusetts, Rhode Island and Connecticut will race 14-foot doublehanded Collegiate FJs in A and B divisions in the waters off St. Mary’s Point at the mouth of Black Rock Harbor. New boats at SAIL BLACK ROCK include a Yngling, a Hobie 16 and rowing dinghy. 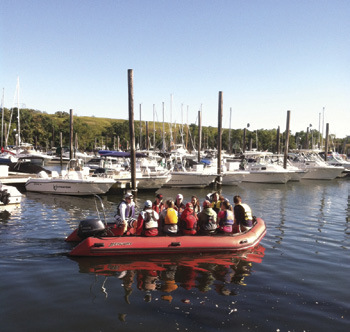 “The Yngling will be used for small keelboat training, which is becoming more popular in college sailing with a fleet in Newport sailed by Salve Regina and other small keelboat regattas at Brown and the maritime colleges,” said SAIL BLACK ROCK Program Director Dave White. Last fall, a combined team of Sacred Heart and Fairfield University sailors competed in the world’s largest intercollegiate regatta, the Storm Trysail Foundation’s Intercollegiate Offshore Regatta, hosted annually by Larchmont Yacht club. Over 450 college sailors comprising almost 60 teams, including several from international universities, raced in blustery conditions. Several boats experienced equipment failures and shredded headsails in the rough conditions, although SHU and FU sailed without incident on Dave Otterbein’s Tripp 37 Breakaway. Future plans include the acquisition of a large keelboat, a varsity summer camp, and a Black Rock Harbor clean up. For more information, contact White at dave@dhwhiterealestate.com.